Christopher Nolan is undoubtedly one of the best filmmakers of the last decade. He has the rare ability of creating original and thought-provoking films respected by even the harshest of critics while also striking a chord with the general public – and making a fair amount of money to boot. After reinventing the super-hero genre with The Dark Knight, it looks like Nolan’s latest effort Inception is set to do the same thing with science fiction and it’s the best of his impressive catalogue of films. To outline exactly what makes this film so amazing is difficult without giving too much away – but I’ll do my best. I watched the film having read very little about the plot and am grateful for it. In short, Dom Cobb (Leonardo DiCaprio) has the ability to infiltrate the subconscious of sleeping individuals and extract sensitive and often valuable information. 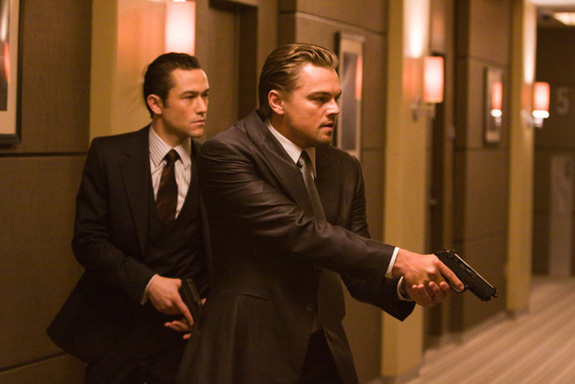 After being ‘auditioned’ by businessman Saito (Ken Watanabe), Cobb is offered one last job – to commit inception. That is, rather than stealing a thought, he will need to plant the seed of an idea in someone’s deeper subconscious and therefore alter the person’s mind permanently. In return, he will be given safe passage back to his children in the US. Cobb gathers together a team of experts to help him pull off his last and most dangerous dream heist. Nolan worked for almost a decade on this script and it certainly shows. One of the most exciting aspects of this film is just how multi-layered it is and that none of these layers are lost in translation to the screen. For much of the movie, numerous plot lines and ‘realities’ run concurrently, but each is easily distinguishable with a specific – and often striking – aesthetic. After the brilliance of Memento, this isn’t too surprising. With so much to explain to the audience about the subconscious, the concept of extraction and inception, and exactly how Dobb’s plans to pull off the heist the script thankfully only falls into unnecessary exposition on the rare occasion. From the opening scene, the film moves at a breakneck speed over the course of 150 minutes and we’re barely given a chance to take a breath. On the IMAX screen this film looks splendid and the fast-paced chase sequences employing hand-held aren’t too overwhelming. As expected, the special effects are as mind-blowing as the concept itself. With The Dark Knight, Nolan showed the world just how good he is at constructing tense action set pieces and here he surpasses anything he’s done before. The hallway scene featuring Joseph Gordon-Levitt became a staple part of the marketing campaign. This is one of the greatest fight scenes I have ever seen. He’s no Jackie Chan, but you’ll understand what I mean when you see it, especially when viewed in context. What’s even more refreshing is the fact that the characters are well-developed and likeable. Nolan once again finds a perfect balance between the action and heart of the story, which is driven primarily by the plight of Cobb. DiCaprio captures his emotional agony well and the audience can easily empathise with him. Out of all the supporting cast, Tom Hardy shines the most as the tactless and quick-witted Eames. My advice? See this film without reading too much about it. Nolan toys with us and forces us to question everything we’re seeing and hearing and leaves it so open that Inception is sure to be talked about for many years. This was by far one of the most enjoyable, exhilarating and engaging cinematic experiences I’ve ever had.